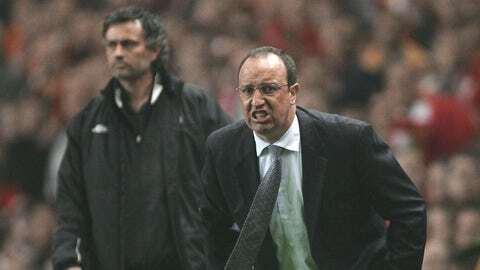 Rafael Benitez (R) and Jose Mourinho during their spells at Liverpool and Chelsea respectively. Rafael Benitez has found himself tasked with clearing up another of Jose Mourinho’s "messes" at Real Madrid, according to the Spaniard’s wife. Benitez was also one of seven Chelsea managers in the six-year period after Mourinho’s first spell at Stamford Bridge, and has now jumped into the Real Madrid hot seat just two years after the Portuguese left the Santiago Bernabeu. Speaking to Spanish outlet La Region, Benitez’s wife, Montserrat Seara, says the former Napoli boss has had to "tidy up" what Mourinho has left behind at each of those clubs. "I don’t know if he’ll ever retire," she added. "All being well, he has 20 years of football left."